Dr. Ghina Shami is a Specialist IVF, OB/GYN. She is Educational Commission for Foreign Medical Graduates (ECMFG) certified and successfully passed the certification process set by the Accreditation Council for Graduate Medical Education (ACGME) in USA. Since acquiring her Medical Degree from American University of Beirut, Dr. Ghina has worked under the close guidance of Dr. Michael Fakih. She is highly respected by her peers for her high ethics and standard in patient care. Dr. Ghina's interests not only include Infertility and IVF related treatments, but also diagnosing and treating PCOS and Endometriosis. 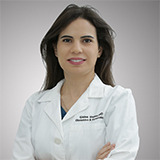 Education: Dr. Ghina received her MD from American University of Beirut in 2008. She then went on to complete her residency in Obstetrics and Gynaecology.